The Terminator Ride-On Floor Scraper line has been around since the early 90’s. The original scraper was invented and created by Innovatech to find a more efficient form of flooring removal for a contractor’s very large removal job. The creation of the Ride-On Floor Scraper revolutionized the floor demolition and surface preparation industry. Since then, Innovatech has continued to release multiple innovative machines to not only meet, but exceed the various market and customer needs. With the launch of the Terminator Infinity All Day Battery Ride-On Floor Scraper, Innovatech now has multiple battery units available to meet the various needs of the flooring removal industry. This blog will compare the two battery operated machines and highlight the main specs and features to make it easier for the customer to figure out which Terminator is best suited for their specific job, or for their business as a whole. Before we get into the actual spec and feature comparison, I wanted to quickly touch on some of the features that all our Terminators have. The first important feature of our Terminator line is the fully enclosed design of all the machines. Many competitive Ride-On Floor Scrapers on the market do not offer a fully enclosed design which allows for important mechanical components to be exposed. Because of this lack of protection, debris can easily damage these exposed components when the floor scraper is being used. – The fully enclosed design of our Terminators prevents that damage from happening. Instead, we have a quick removable panel on the front of our machines for easy maintenance and service, without sacrificing protection of the important mechanical aspects of the machines. Another key feature is our “creeping” drive function. This unique drive system lets you ease into movement to avoid that unpleasant “jerking” driving experience. It’s also helpful when you’re removing flooring close to walls and other objects. The more control you have of the machine, the better. Another great benefit of the Terminator Ride-On Floor Scrapers is that it is compatible with different tools and blade sizes. You can use up to a 26” jaw and blade on all of our Terminator units to increase production per pass. Many other units on the market can only push a 13” jaw and blade because they don’t have the proper power for a larger blade. The T3000EI is an incredibly hard working, industrial machine. In addition to the features we’ve highlighted above there are a few key things about this machine that are important to consider as you research what is best for your job or business. 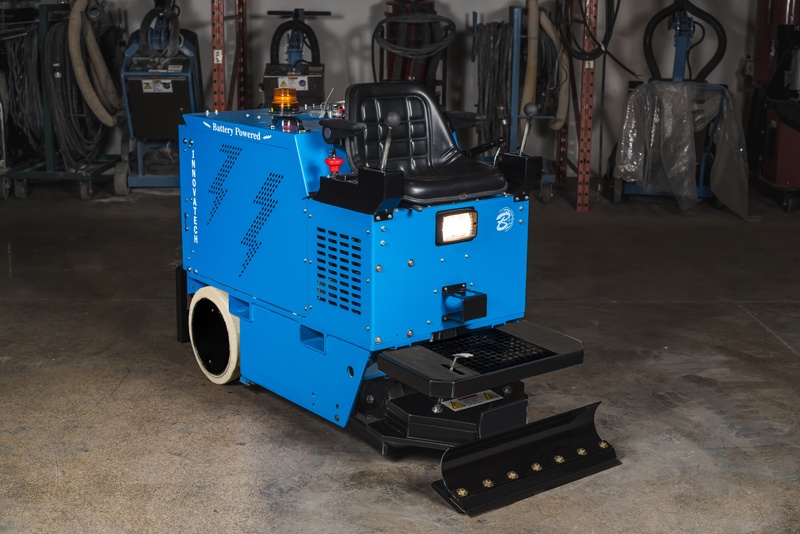 The T300EI as a travel speed of 200ft/minute which is incredible for a battery-operated Ride-On Floor Scraper that weighs 2,757LBS. IN addition the variable speed controls allows the operator to move at a pace they feel comfortable with. They have the option to slow down when near walls, and easily maneuver in awkward corners or rooms. The combination of high travel speed and weight, and easy operator control thanks to the variable speed, allows for remarkable production rates. This machine will easily remove up to 80-90% of coverings on first pass, however one of our happy customer told us this machine easily ripped through two layers of tile in one pass. Another thing to point out is the option of AGM No-Maintenance Battery. Although the T3000EI is available in Led Acid or AGM battery options, we generally suggest AGM No-Maintenance for a couple of reasons; They’re stronger and safer. Not having to deal with battery maintenance avoids anyone from coming in contact with corrosive battery acid which is a bonus for the operator as well as the dealer or rental house who sells or rents these machines. This machine is best suited for contractors needing a battery-operated machine for large tough jobs, where weight restrictions aren’t an issue. The weight and speed of the T3000 EI will easily rip through even the toughest floor coverings. The added value of the variable speed makes a world of difference for the operator, especially when that much weight and force is involved. Being able to better control a machine around tight areas or near walls will help to prevent unwanted damage. The AGM NO-Maintenance battery option is another awesome perk. This powerful battery is one less thing you have to worry about in an industry full of safety hazards. You just plug it in when it needs to charge and you’re good to go. You never have to fuss with any sort of battery maintenance, which saves you time and avoid the possibility of coming in contact with corrosive battery acid. The T3000EI is a perfect option for larger dealers and rental house who are selling or renting to contractors doing large difficult jobs. The weight of a T3000EI may be an issue in some smaller buildings and exceed elevator limits. However, contractors removing large areas of difficult material such as ceramic tile will be thank you had this machine as an available option. They’ll be able to easily finish their job in less time allowing more opportunities for new jobs. It’s a win-win situation. In addition, the AGM battery option is a bonus so you don’t have to worry about anyone coming into contact with battery acid. It’s also one less thing you have to worry about being tampered with while its rented out. The peace of mind alone is worth it. If you’re interested in more details on specs and features simply click here. The Terminator Infinity is our newest addition to the Terminator line with the same amazing features as we discussed above, with a few game changing additions that will make a world of difference in a competitive market. The Infinity is a slightly lighter machine that that weighs in at 2,430 Lbs. This is a great option for those who are limited by weight restrictions. Although this machine will still be able to remove those tough floor covers, it won’t be quite as fast at removing them as the T3000EI because with less weight, you have less down pressure. The biggest feature of the Terminator Infinity is the All-Day AGM No-Maintenance Battery. Depending on the job conditions and the operator, the Terminator Infinity will continue to work as hard as you for 8-12 hours without any need for maintenance, and before needing to be recharged. In addition, the 110V dual on board charging system charges 30% faster, increasing your opportunity to get more work done in less time. When every minute counts, the All-Day AMG No-Maintenance battery and decreased charging time means more money in your pocket. The Terminator Infinity is ideal for the everyday contractor doing consistent removal jobs where an All-Day No-Maintenance battery, super quick charging speed, and excellent production rates are an asset. If that sounds like you, then why not enjoy the benefits of the best machine at the best price? Why not get more done, in less time so you have more opportunities for new jobs? 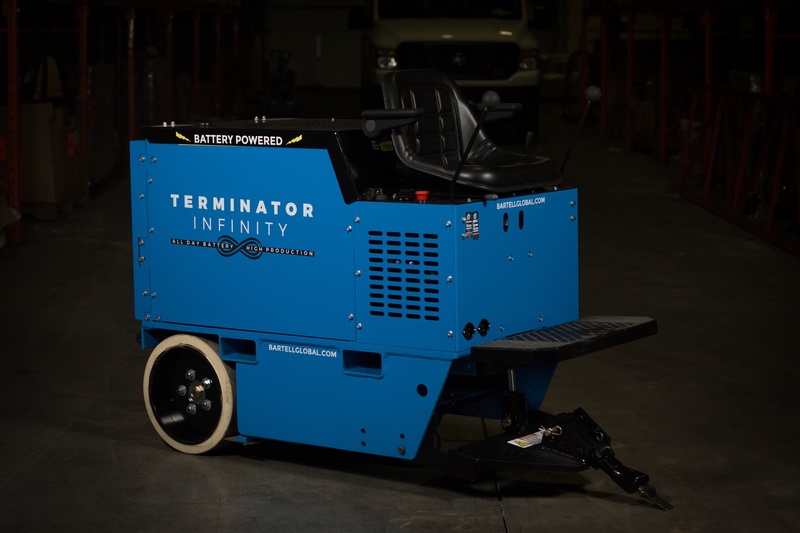 The Terminator Infinity is the first Ride-On Floor Scraper created with not only the contractor in mind, but the Dealers and Rental houses as well. The Infinity is a great option for any Dealer or Rental house who rents or sells any type of floor scraper. This machine caters too various demolition, and construction markets making it an easy money maker. The All-Day AGM No-Maintenance Battery and 110V dual on board charging system, and excelent production rates are just a few of the reasons that make this the most desirable Ride-On Floor Scraper on the market for the everyday contractor. Not to mention the incredible innovation that went into the Terminator Infinity Ride-On Floor Scraper has allowed us to offer it at a better price than any other comparable Ride-On Floor Scraper in the market. In an incredibly competitive market, where every minute counts- why not invest in a machine that will easily and efficiently get the job done and set you apart. Innovatech invented the Ride-On Floor Scraper and has had over 20 years of continuing innovation to perfect it according to market needs. Our goal is to make your life easier, to help you get the job done faster, help solve your floor removal struggles and ultimately make you money. Both machines are extremely productive when removing flooring; the T3000EI and the Terminator Infinity are leading the industry and exceeding the production of competitive comparables. Either one would be a great option for your business, but ultimately, you need identify what are the most important features and what will be the biggest benefit and best investment. Click here for more information on Bartell Global products.